The St Vincent de Paul Society is supporting the #notmydebt campaign to draw attention to the pitfalls of Centrelink's automated debt recovery program. Read our media release and news items on this issue. Video courtesy of the Victorian Council of Social Service. The National Social Security Rights Network has prepared a factsheet to help you if you receive a letter from Centrelink asking you to confirm your income at myGov, or are contacted by a debt collector about a Centrelink debt. This factsheet explains the letters you receive, how the online system works, and where you can find help. While Vinnies are not equipped to provide individual advice, we suggest that people who need further assistance seek advice from their local welfare rights centre, legal aid service, or community legal centre. If you believe you have received a notice for a debt that you do not owe, or if the debt is higher than what you may owe, you can lodge an appeal with Centrelink (with advice from the legal services listed above). You can also appeal the recovery fee or interest charge on a debt. GetUp! has also developed an online tool called Fraudstop, which helps people to lodge appeals. People affected by the debt recovery program are also encouraged to contact their local MP to share stories about the impact of the program and to request assistance by phone, mail or via a face-to-face meeting. Some people have had success having their issue addressed with the intervention of their local MP. If you're not satisfied with Centrelink’s response, you can make a complaint to the Commonwealth Ombudsman by completing an online complaint form or by calling 1300 362 073. You can also register your concerns at the #notmydebt website, or use the twitter hashtag #notmydebt. 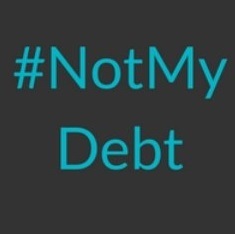 #notmydebt is a website and grassroots social media campaign working to highlight the human impact of the debt recovery program. It is building a collection of anonymous stories from members of the public who have received Centrelink debts that they believe are undeserved. The #notmydebt team are also organising rallies and other events across Australia to campaign for change to the current debt recovery system. You can also voice your concerns by preparing a written submission (or letter) to the Federal Parliamentary Inquiry that is currently examining the Centrelink debt recovery program. The Inquiry is accepting submissions up to 19 April, 2017. Advice and suggestions on how to prepare a submission to this inquiry can be found here. In addition to accepting written submissions, this Parliamentary Inquiry is travelling around Australia to hear from as many people as possible about the impact of the debt program. Those Committee conducting the Inquiry want to hear your story about how you, or your family or friends, have been affected. They are making available three minute spots for people to tell their stories. If you, or a friend or family member, would like to share your story at the inquiry hearings, you can find further information and instructions on how to register at the Australian Council of Social Service (ACOSS) website. The Australian Council of Social Service has also prepared a helpful factsheet, ‘Privacy when participating in a senate inquiry’ outlining how submissions can be made confidential. For example, the factsheet includes advice on how to write a submission to a senate inquiry and make your story public without revealing your name or other identifying information.